Come create a painting or drawing in one fun, relaxing evening! No art experience is needed as our Myart teachers take you step by step through creating the featured artwork of the month. We provide all of the art supplies. At the end of the event, you take home an amazing piece of artwork that you created - come paint and have blast at Myart! Parents, drop off your kids and go have some fun! No need to feel guilty, your kids will have a blast painting! We will guide your children through the chosen artwork. They will have a wonderful experience painting with acrylic on canvas, or painting with watercolor and maybe some collaging and best of all at the end of the evening they will bring home a masterpiece. Registration required. 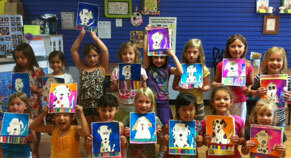 Myart Painting just for Kids, Ages 5&up at the Fishers Studio. Schedule your own Mommy and me event and be inspired to create together at Myart! We will help your child gain confidence with their skills, encourage self-expression and artistic exploration through guided drawings, using all mediums and new techniques. Cost/student $15 per mom & child with a minimum party of 8 fee of $120.00. Myart Adult Painting Events at our Fishers Studio! At Myart, we put the "ART" in party! We provide the instruction and all of the art supplies needed for your birthday child and guests to create an amazing piece of finished artwork. You are welcome to bring cake, candles, balloons, treats, or whatever you like for the birthday celebration. Just give us a call and we can create the perfect party for your Picasso! Invite your friends for an artistic birthday party that starts with a guided drawing and ends with a masterpiece! We have many themes to choose from and we also offer a choice of mediums, from marker and watercolor to oil and chalk pastels. Everyone loves to paint! Your guests will feel like a true artist as we lead them start to finish with their very own acrylic painting on canvas. Choose from a variety of paintings to match the interest of the birthday boy or girl. Myart scout parties are fun and exciting, not only will your troop learn how to draw, they will take home a wonderful piece of artwork that they created on their own. Our Myart teachers will take your troop through a step by step process to create the chosen artwork. They will then demonstrate and teach the kids how to use the medium for the drawing to get amazing results. Leaders, bring your troop in and learn how to draw and have fun! Cost/student $15 per child with a minimum party of 6 fee of $90.00. Cost/student $20 per child with a minimum party of 6 fee of $120.00.